After settling into my hotel, I figured out how to get to Restaurades, to get to the tourism bureau to buy my Lisboa card. 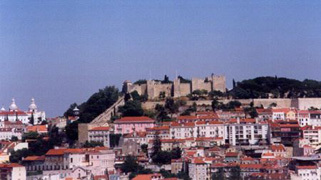 The first thing of consequence that I saw was the Castelo São Jorge. Lisboa is hilly like San Francisco. I saw the Castelo from the other side of an urban valley, from a pedestrian stair-sidewalk. An interesting feature of the Portuguese capital is that despite the construction that seems to be in every street, the place looks much like it did in 1938. Parts probably even look much as they did in 1638. 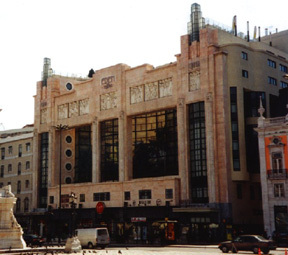 The Eden Theatre (below) is the site of a glamourous art deco building that used to be a movie theatre. When I was there, it was the final days of a Virgin Megastore. I read that there is a beautiful rooftop pool; there are some condo units above that big glass wall you see there. Up the block was the tourism bureau; across the street, the architecturally interesting post office, with the world's most morose postal workers. Too morose to be postal. Also up the block was the Elevador da Gloria, a funicular cable car that has been operating since 1885. I took it daily to get to the Metro. Lisbon is at the mouth of the Tejo River (in English it has a less-romantic-sounding name: Tagus). Lisbon's (now faded) glory dates back to the 16th Century's "Discoveries." The Tejo saw many ships set forth and return with spices and other things from parts unknown. These azulejos (tile) panels show some traditional sea-going vessels. Lisbon has a maritime museum as well as a museum for azulejos. There are blue-and-white tiles everywhere in Lisboa, in museums, stores, homes, restaurants. Inside and out. The bridge show here is the former Salazar Bridge, which was renamed the Ponte 25 de Abril when the Carnation Revolution bloodlessly ended the 40-plus-year dictatorship that kept the entire Portuguese people uneducated and isolated from the world. 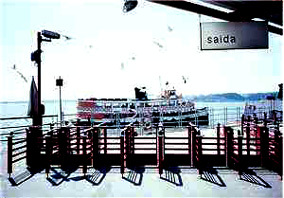 This bridge helped alleviate the problem of people needing to cross the Tejo to get into Lisboa. It is a lot like the Golden Gate Bridge in San Francisco. There are still ferries, though. The transtejo service still runs, though, and is crowded with folks who work everyday in Lisboa. It's a nice ride. Seeing Lisbon's hills rising from riverbanks, especially as the sun sets, is quite beautiful. For me, it almost became more beautiful when some nice-looking middle-aged man stared a hole through me. Turns out he's a fundamentalist. I thought I was being cruised, not saved.